Well, looks like the SouthWest Monsoon is kicking in a week or two early this year. Over the last few days we have had some quite strong westerly breezes, enough to stop speedboats heading out to the Similan Islands from Khao Lak, enough yesterday even to stop a few bigger liveaboard dive boats. I am checking the wind forecasts on Windguru several times per day. At the moment looks like winds and waves will decrease into next week. The BuoyWeather forecast agrees. So hopefully all the dive trips will run as normal after today. But for sure, the winds have well and truly changed. No rain? Well, yesterday had some dark skies and patchy showers. Today has been very hot and sunny, but cooled by the sea breeze. One has to remember than the word "Monsoon" refers more to wind than rain. Here in Phuket we have 2 monsoons - the Southwest from May - October and the Northeast from November - April (approximately) - more details here: Phuket Weather Overview. I took a walk on Karon Beach before lunch today. Hot weather, mostly blue skies, but big waves. The people in the photo below are not being too sensible. 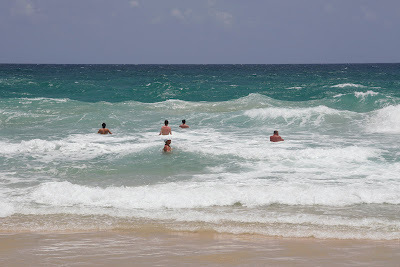 There can be rip currents on Karon Beach when you have waves like this. Every year there are a few tourists who drown around Phuket's beaches in the low season - splashing around in the waves can be fun, but take care.. or stick to the hotel pool!